We have some good friends who own the Texas Rangers, and from time to time Joey and I would go see a game with them. I have been to only a few major league baseball games in my life, so when I go see one with the owner of the team, it’s kind of a different experience. Joey had never been to a major league game before the first time we went to one at the Rangers’ ballpark. We had been visiting our friends at their home in north Texas, and late in the afternoon when it was time to head to the game, we jumped in the car with them to go. Soon we were sitting in a jet, and twenty minutes after that, we were getting back into an SUV headed the mile or so to the ballpark. Three motorcycle policemen were waiting for us when the plane touched down, and as we drove off the tarmac toward the stadium, they led the way. Sirens blaring and lights flashing. They stopped traffic in front of us, and we never even had to slow down. Driving through intersection after intersection, through what seemed like a sea of cars, all trying to get to the same place we were. It was clear that Texas is proud of their ball teams. “This is just like the president,” Joey whispered in my ear, as we crossed another intersection and people stopped and stared and waved. And it was. I had never seen anything like it. A few minutes later our black SUV disappeared into the belly of the ballpark and up a ramp to the owner’s parking spot. Some security men led us the few feet to a door that led to a hallway that led to the owner’s box. We hadn’t walked twenty steps when another door to the hallway opened up, and George W. Bush stepped in front us. “Well, hello, Mr. President,” our friend said. The president smiled at Joey and shook her hand. “And this is her husband, Rory.” The former president of the United States just sort of stared at me for a few seconds. I’d like to think that he recognized me from our TV shows or was a big fan of our music. But more realistically he was trying to figure out how I managed to marry such a beautiful woman. 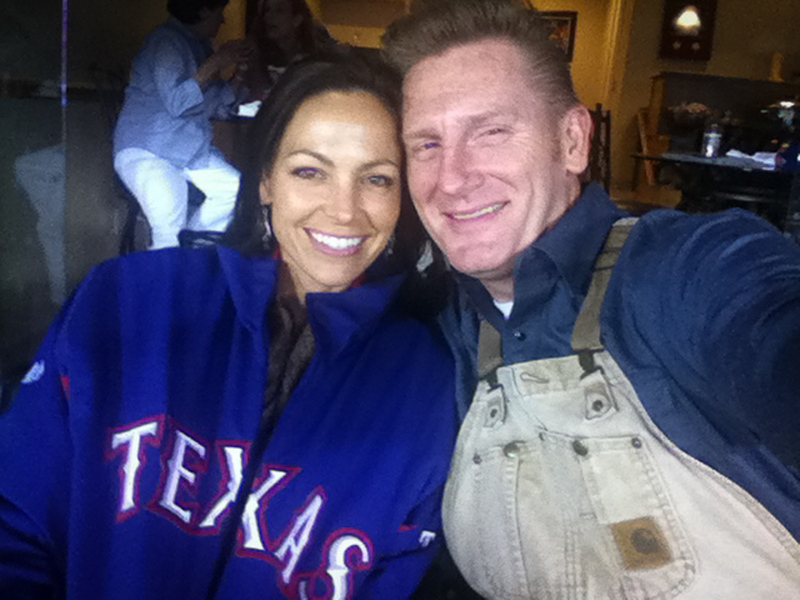 And also why a guy was in bib overalls at a Rangers game. And why was he friends with the owner? He shook my hand and smiled. “Nice to meet you, Rory,” he said. And he headed to his seat, and we headed to ours. As we watched the game from high above the Rangers’ dugout, drank, and ate the free food and ice cream to our heart’s content, I turned to Joey, and she was smiling. “This is crazy, isn’t it?” she said to me as she snuggled into my arm. Just like our whole life and love story together was. And is. Filled with stories that are hard to believe but are true. Always pinching ourselves, saying, “Wow, isn’t this something . . .” in the very hardest and the very best of times.